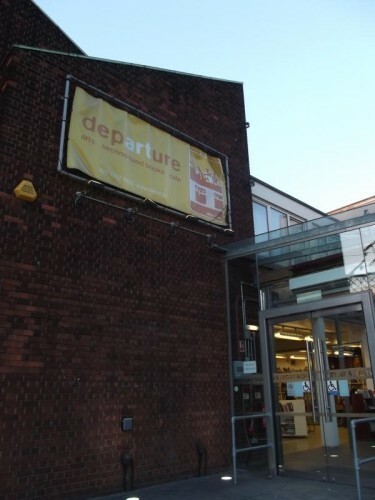 Opened in May 2007, Departure is set far down Commercial Road on a former bomb site, part community centre and part café. It’s quite hard to define a place that does so much; Friday sees a free cinema night covering non-mainstream films and there's currently a ten week course on learning how to draw. Free 'crafternoons' for knitting and crocheting, a book club and acoustic jams – amongst others – take place weekly, too. It’s got a relaxed and eclectic interior, with a partial glass façade, mismatched decor, books everywhere, acoustic music and plenty of seating. On a weekday night, it's quite full with a range of people. There's mainly students making use of the free wifi, couples catching up and a few just chilling with a book. There's a good range of homemade food and drinks at prices you rarely come across in London, as well as halal options. It's £1.60 for a pot of tea and £4.50 for a vegetable lasagne. They do everything from cakes and healthy snacks, like carrot and hummus, to breakfast and dinner. While it’s not obvious to those briefly visiting, Departure is run by Christian organisation London City Mission, who aim to provide a safe space for people to meet others. As 45% of the local population are immigrants, one important function they run is the informal and free English lessons. Another major aim is to support local art. They have a gallery area in the café with paintings by local artists, with the previous series from The Limehouse Group – those who attended classes here. Also, they've recently started a new programme called Husk that focuses on graduate work and is run ‘by artists for artists’. At a first glance, you might think it fits in with the arty cafes popping up in the East End’s steady wave of gentrification. However, it's clear when you talk to someone a little or do some research into the organisation that they're trying to make a difference through providing a place where people can connect, experience something new and learn interesting skills. Find Departure at 649-651 Commercial Road, Limehouse, London, E14 7LW.